Apple picking coinciding with back to school required apple lunchbox snacks. 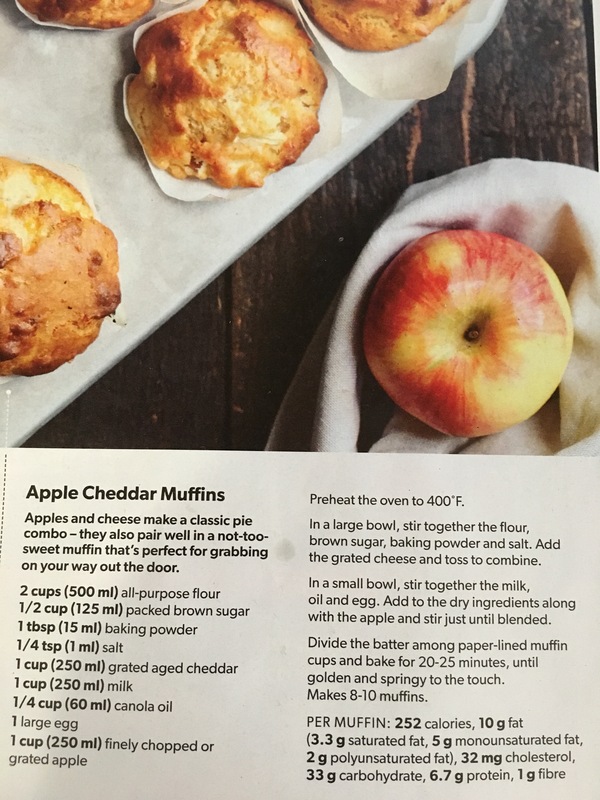 I saw this muffin recipe in a Canadian Parent magazine and had everything on hand so we made muffins. 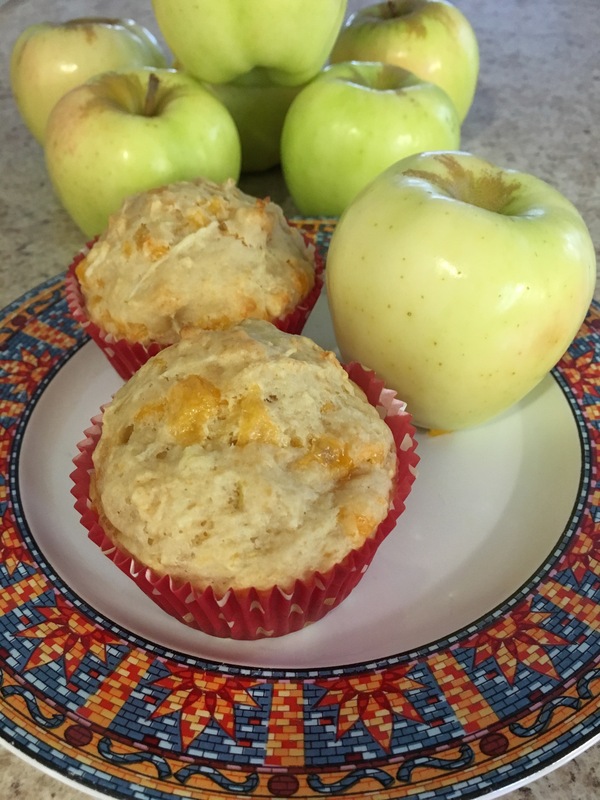 This is a versatile muffin because it isn’t very sweet and it can be for breakfast, snack or paired with a savoury meal. Though we ate these for breakfast and morning snack, I think these would pair really well with chilli. I really like these muffins, but we haven’t had them in quite awhile. The recipe is from my cousin, not sure of the original source, but we have had the recipe for many years. I ate a lot of these in the days after Evie was born, it was one of my sources of sustenance. I kind of needed a break after that, but I thought of them the other day and voila. 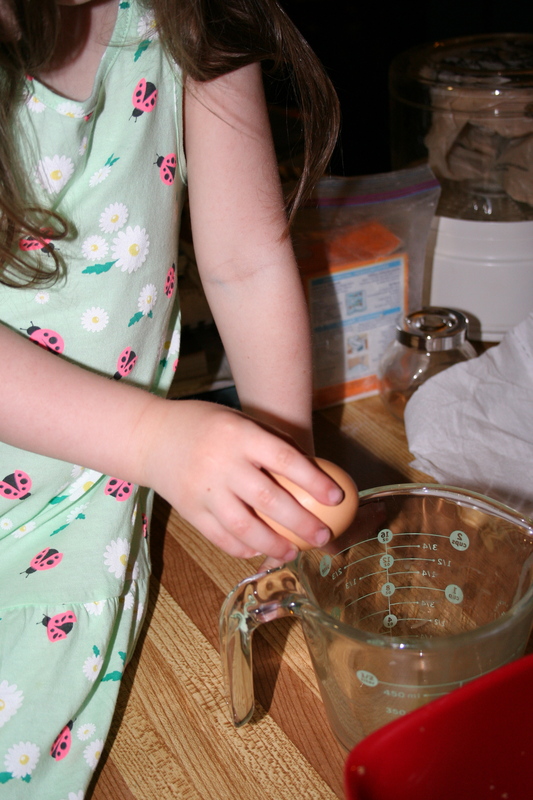 Add wet ingredients to the dry ingredients and let sit for 1-2 minutes. 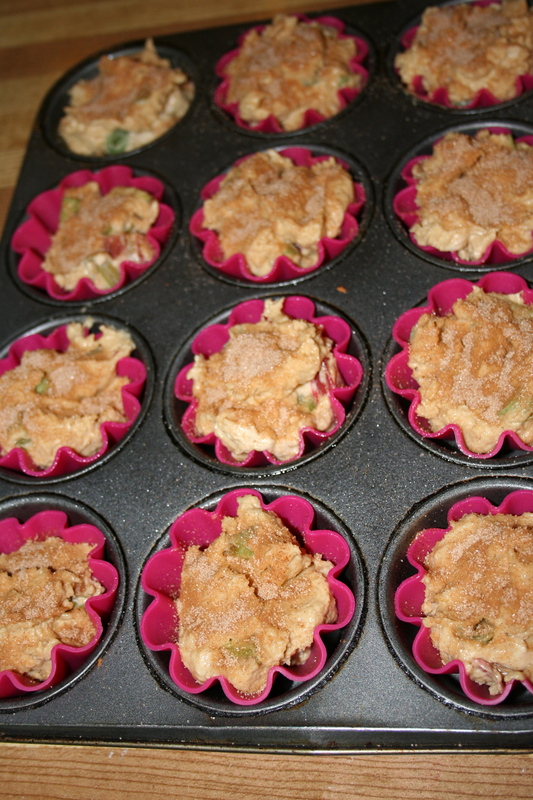 Fill greased muffin tins, or use liners, 3/4 full. Bake at 350F for 20-25 minutes until done. *Note: You can add in 1/2 cup of berries if you would like to make them into berry muffins. I was given a large bag of frozen blueberries by my neighbour, who received a large amount from a friend who is a farmer and picked them fresh and then froze them. I did a split batch here, filled half the cups with non-berry batter and then added a couple of handfuls of berries to the rest of the batter and finished filling the cups. I think peach season is probably over in most areas by now, although you can still get them at the grocery store. We had a basket of peaches that had a few left in the fridge almost past their prime. 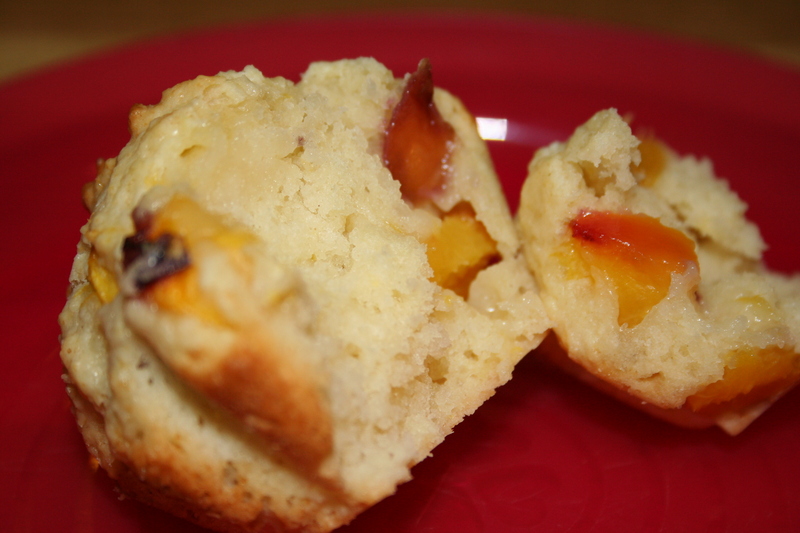 When you have over ripe fruit make muffins! I was pressed for time since the peaches were spoiling fast and it was a week night. 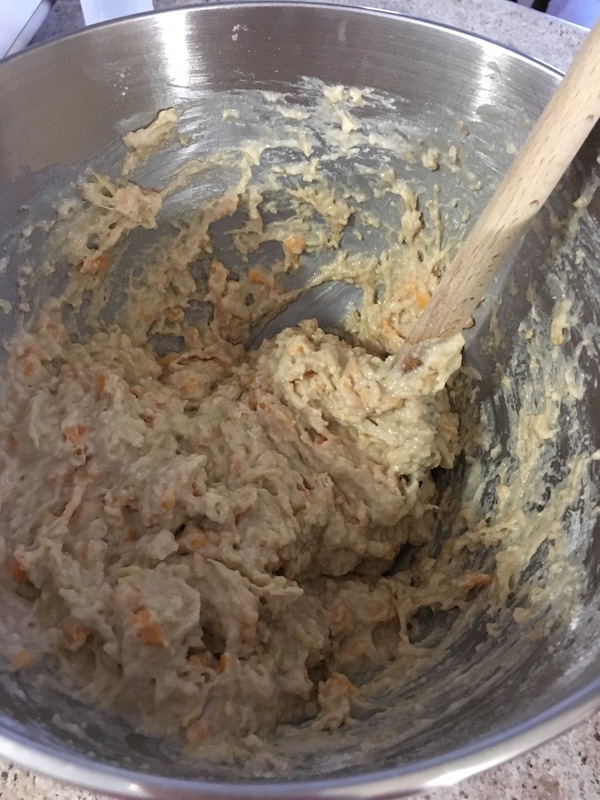 I found a recipe that was short and seemed fairly quick to whip up. 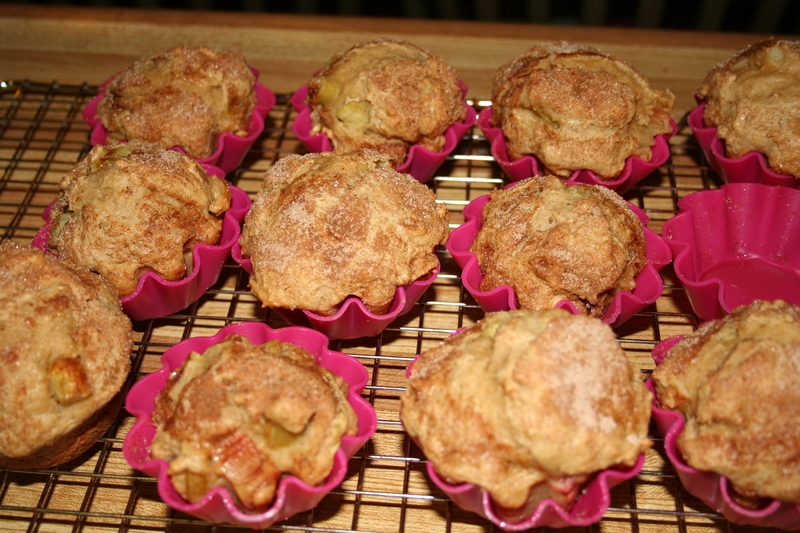 This recipe is adapted from a Taste of Home recipe, I had to change it a little because the batter seemed really dry. These turned out really good. I got 12 regular-smallish sized muffins out of the recipe. 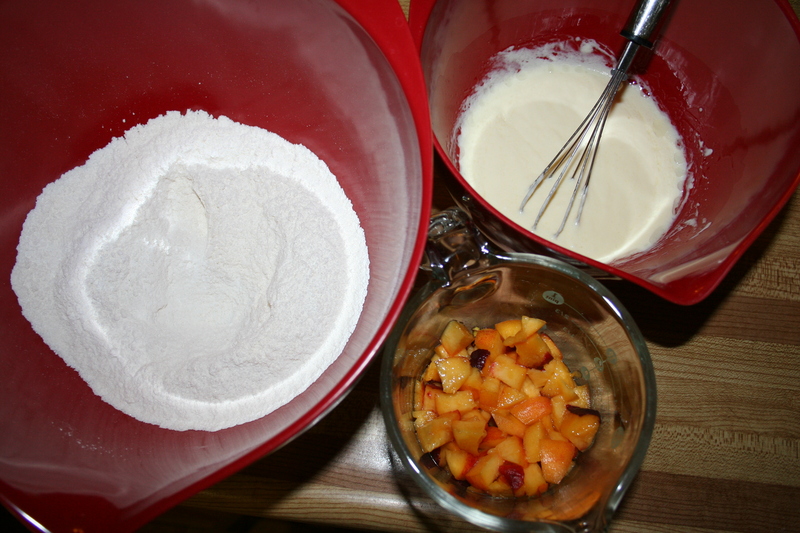 Stir wet ingredients into the dry ingredients just until moistened and then stir in 1 cup of chopped peaches. 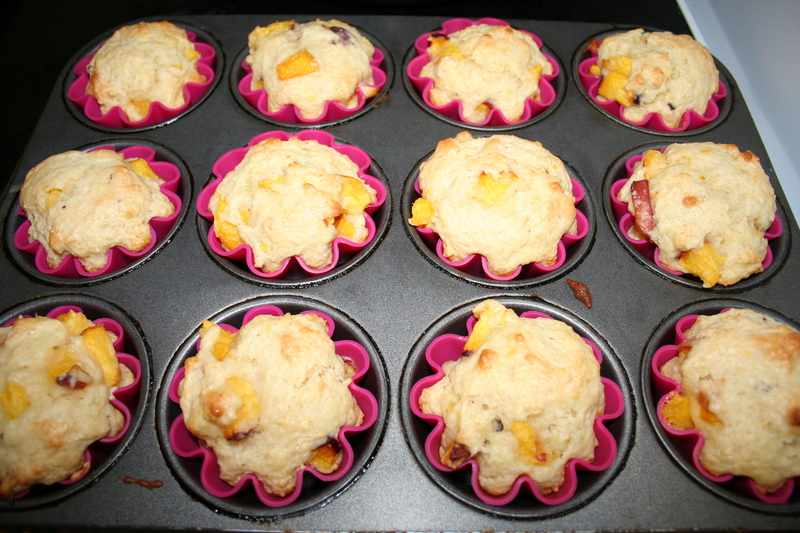 Place in greased or paper lined muffin pans and bake at 350F or about 20 minutes. They should be lightly golden on top and a toothpick inserted into a muffin comes out clean. Cool for about 5 minutes in the pan and then turn out onto a wire rack to cool. 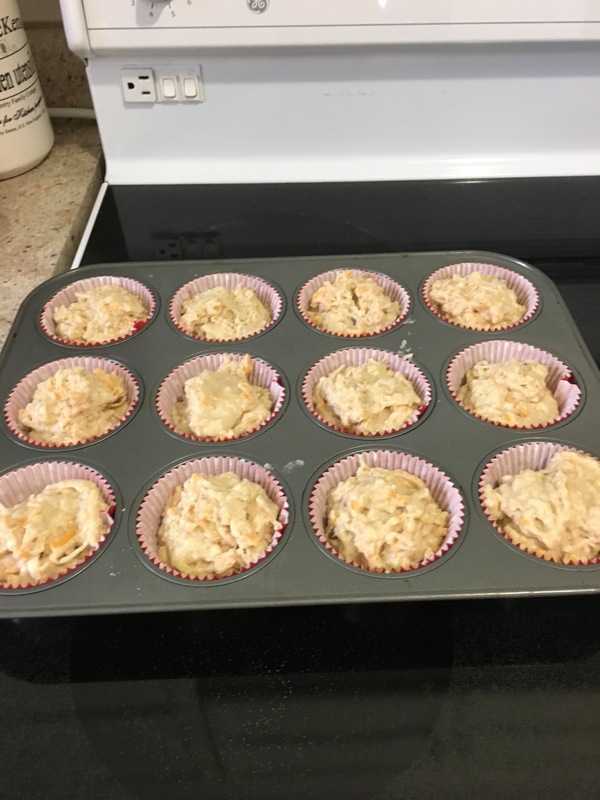 I also found another Peaches and Cream muffin recipe from the website that I like, mennonitegirlscancook.ca, that has a streusel topping. I am going to try that one later when I have more time. It sounds moist and really good. 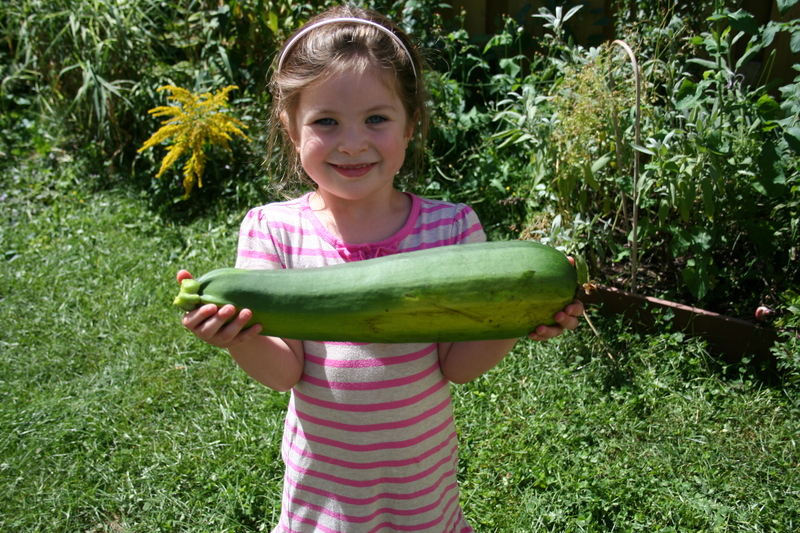 We have an abundance of zucchini from our garden right now. 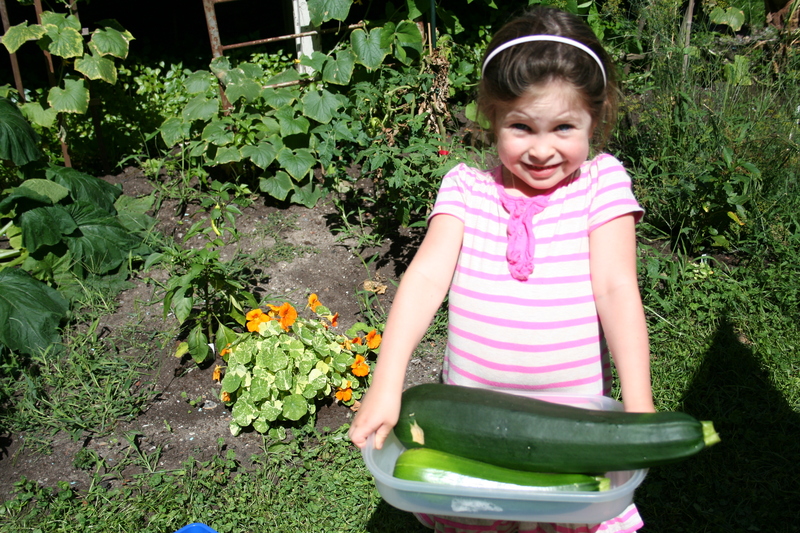 The most recent one we picked was huge, 7lbs, of course we had to weigh it! I think it grew overnight. 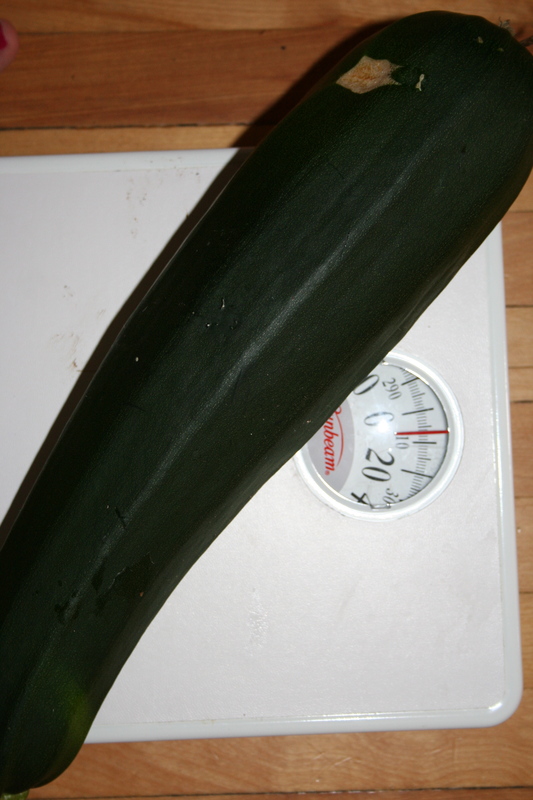 We made some zucchini muffins for the freezer. 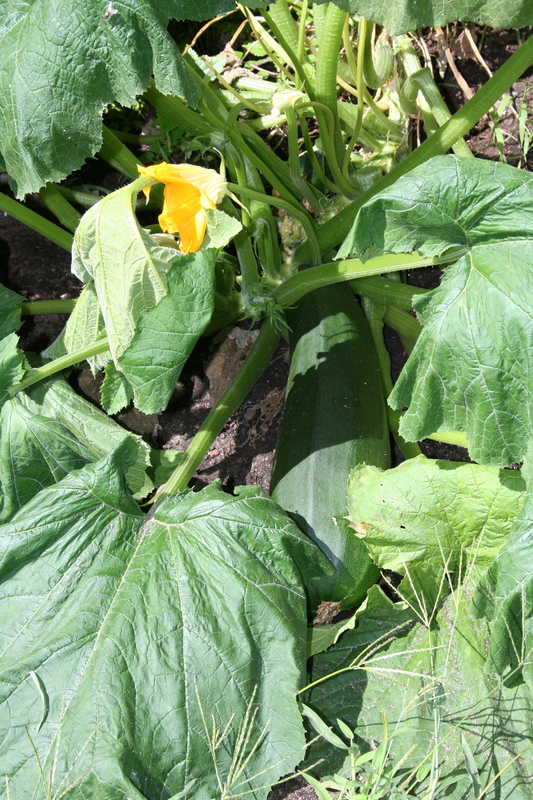 This is a recipe that was given to us by someone a very long time ago and we make it when zucchini is in season. 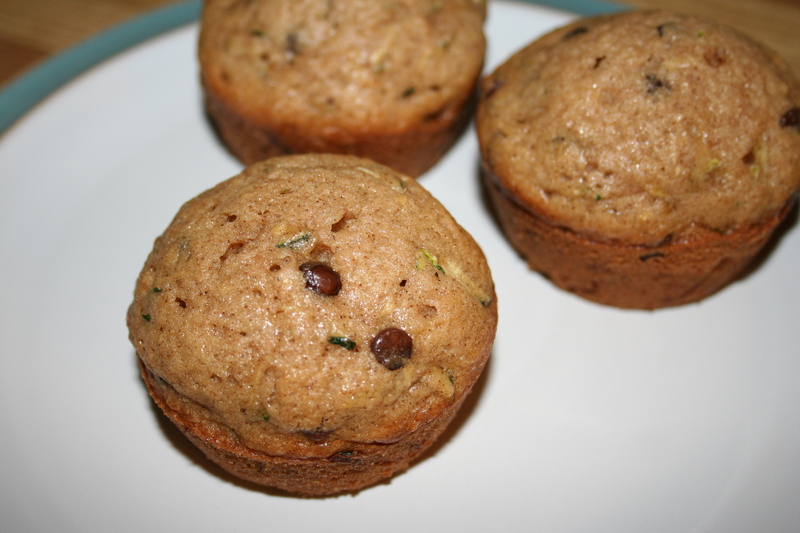 This recipe gives two dozen muffins or you can make loaves. Mix the above ingredients together in a large bowl. 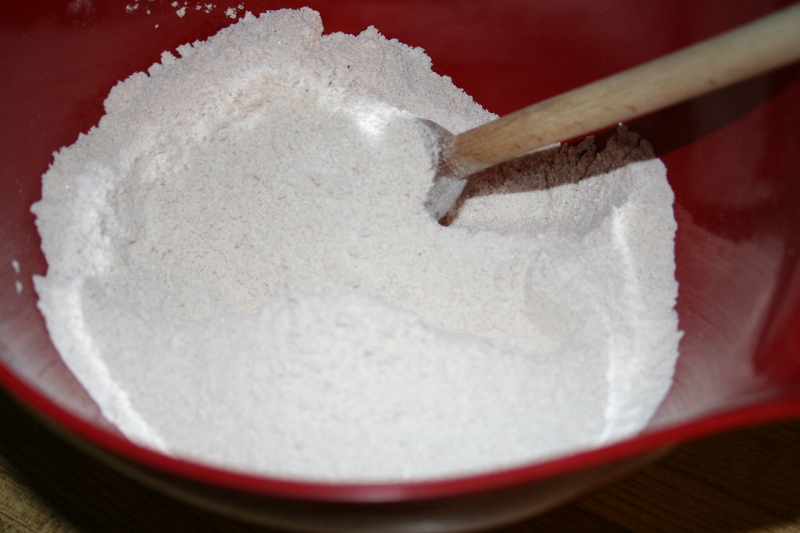 Make a well in the center of the dry ingredients and pour in wet ingredients and stir just until combined. of course for fun we add 3/4 cup chocolate chips. 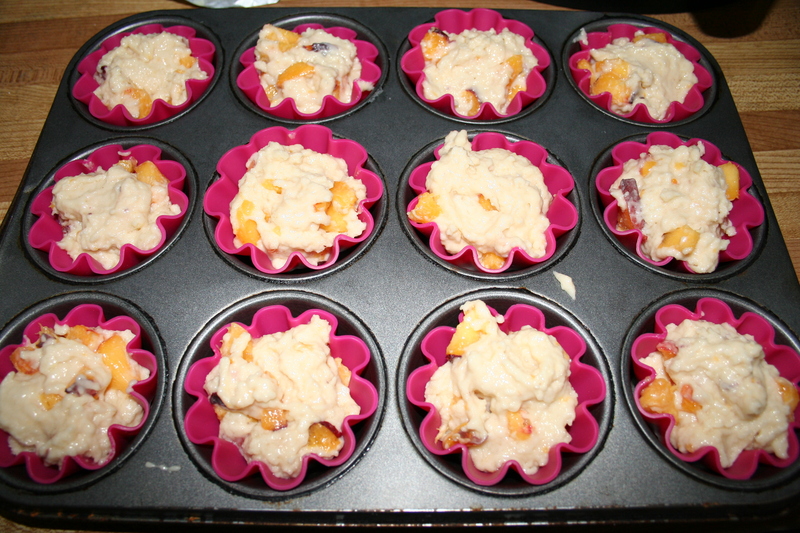 Place in muffin tins and bake at 350F for about 18-20 minutes until done. If you are making loaves bake for about an hour. Test to make sure it is baked all the way through. These freeze well also. If I freeze the loaf I slice and wrap the individual slices before freezing. 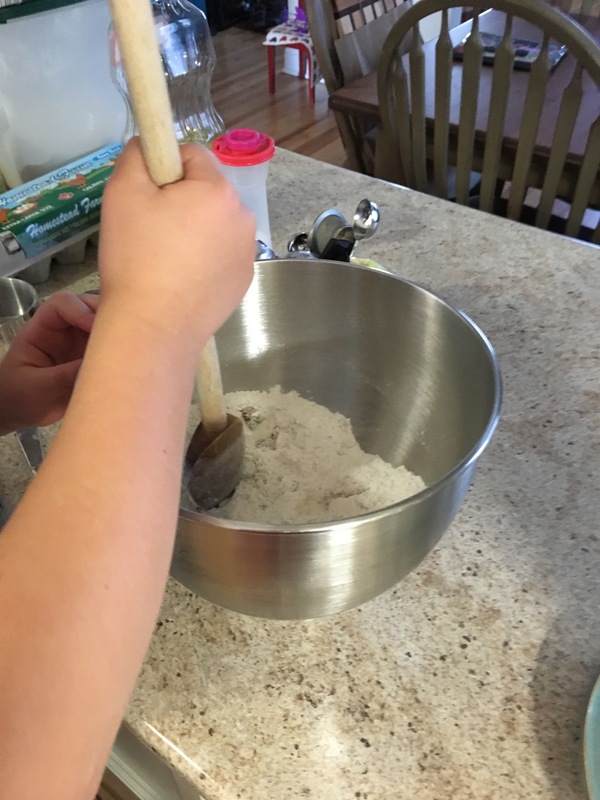 In a large bowl add 1 and 1/2 cups all purpose flour, 1 cup of rolled oats, 1/2 cup sugar, 2tsp baking powder, 1tsp baking soda and 1/2 tsp salt. I also add 2-3 tbsp of flax meal. Mix well. 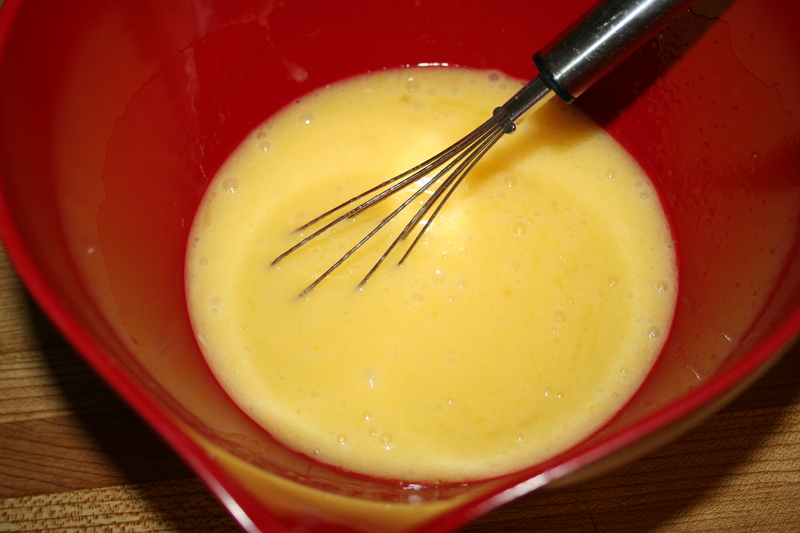 In another bowl whisk 2 eggs until frothy, 1/4 cup cooking oil, 1/4 cup milk, 3 medium overripe bananas, mashed (about 1 cup and a bit). 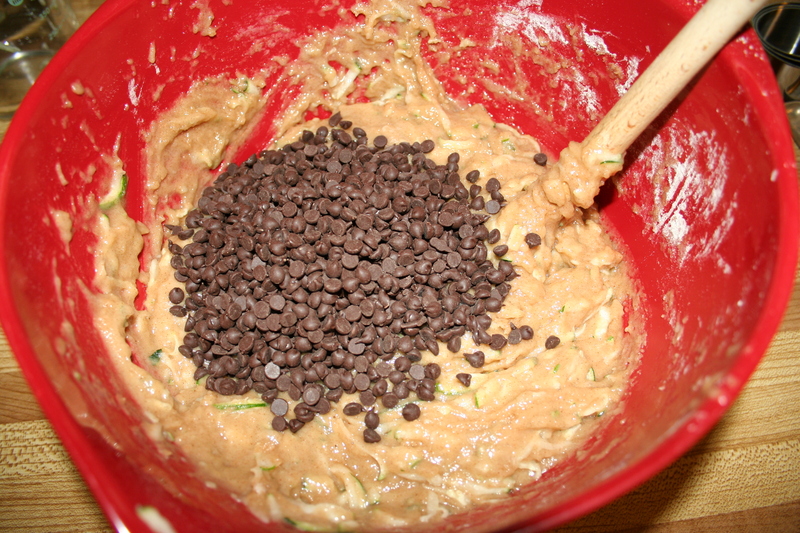 Pour wet ingredients into the dry ingredients along with half a bag of chocolate chips. Stir with a wooden spoon just until moistened. 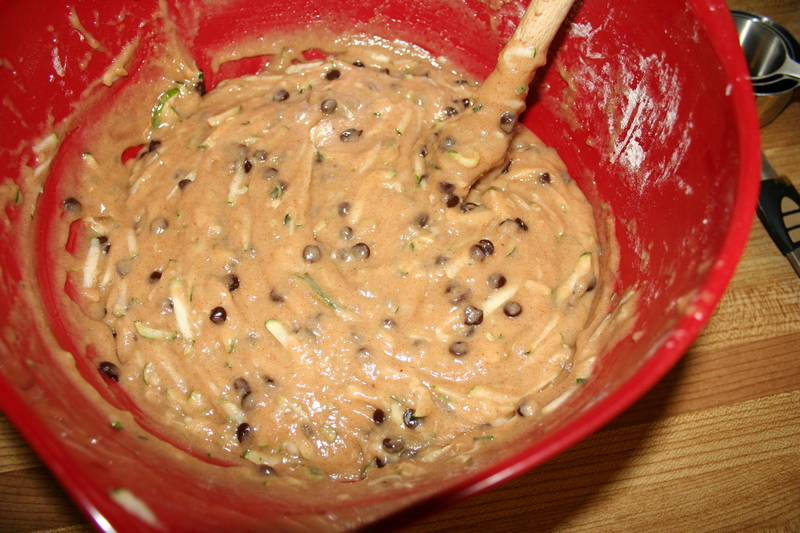 Do not over mix (batter will be lumpy) or your muffins will be tough. Bake at 350F for about 18-20 minutes. These freeze well also. We wrapped some individually in clingwrap and then placed in a container, so we can pull them out as we need them for breakfast or lunchbox. We finally got to start the garden. We weeded, dug and planted, now we have to just wait. 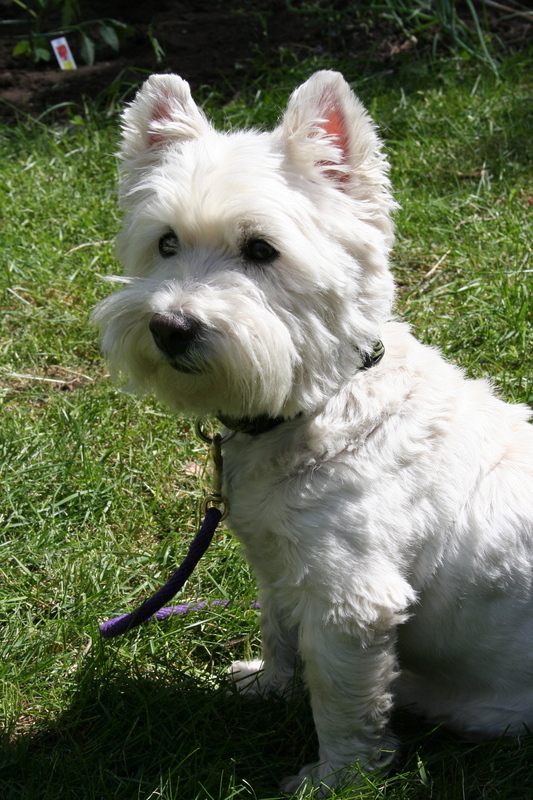 Max kept watch to keep the squirrels out. 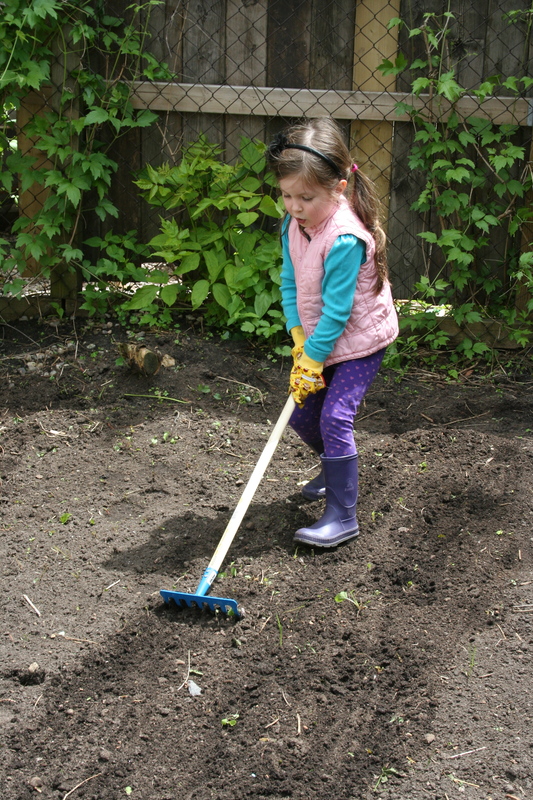 The whole time we were outside Evie kept asking when we could cut some rhubarb. Our rhubarb is still a small plant with little stalks. I wasn’t sure what to make since we didn’t have much, then I found a rhubarb muffin recipe from Susan (I love this blog) at A Cake Bakes in Brooklyn (www.acakebakesinbrooklyn.com), and I had just enough rhubarb to make the cup we needed. 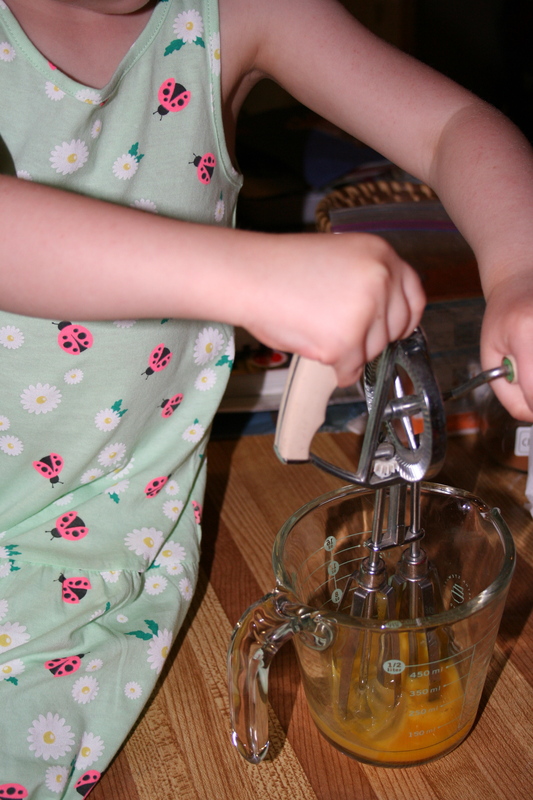 The old handmixer we found at an antique store when we were visiting the farm and had to get it. It is perfect for Evie to use. 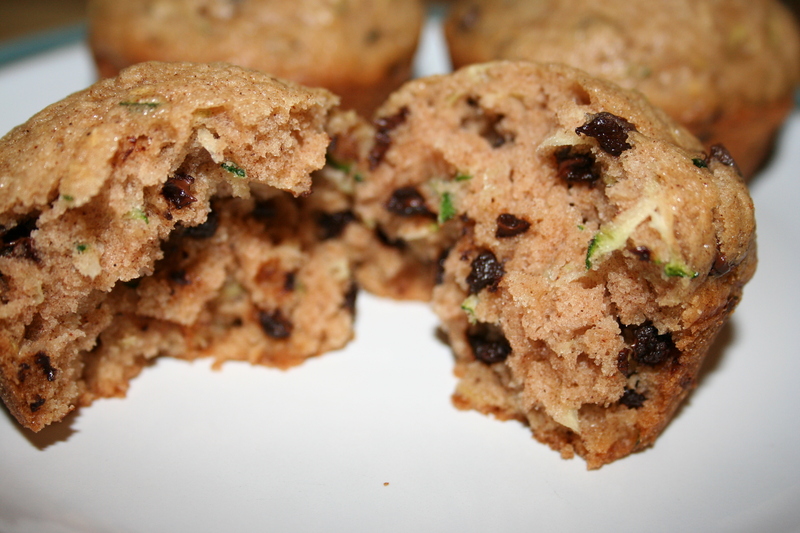 These muffins were so tasty and very moist. 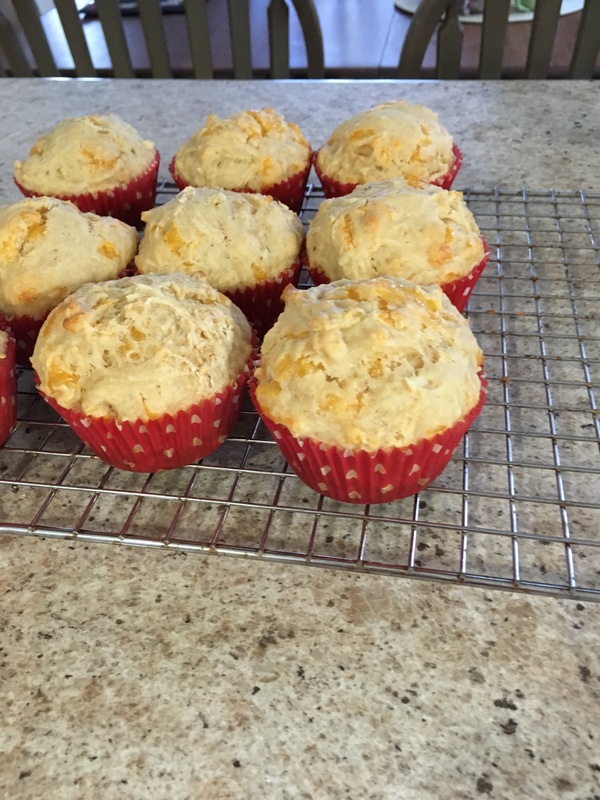 We really liked them and will definitely add them to our recipe book to make again. I have a few rhubarb recipes that I love. I have to try to make a couple more before the season ends. 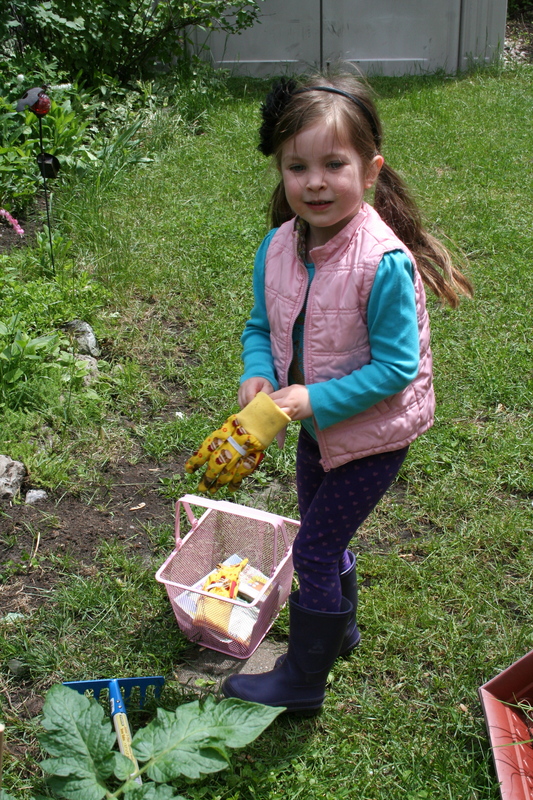 Maybe tomorrow morning we will go to the farmers market to get some and make something for dessert tomorrow night.